We’ve had a fairly solid lineup of coming-of-age films as of late, both in mainstream and independent cinema. But every once in a while, we get a film like Flower that is just so unique and comfortable in its own skin that makes it stand out from the rest. Zoey Deutch stars as Erica, a sexually fierce and totally independent teenager, who targets sexual predators and blackmails them for money. She has a fairly dysfunctional but nonetheless loving relationship with her mother (Kathryn Hahn) and a c0ld one with her mother’s boyfriend Bob (Tim Heidecker) who moves in with them; causing a disruption in her usual flow of life. To make matters more confusing, Bob’s mentally unstable and overweight son Luke (Joey Morgan) is newly out of rehab and moving in with Erica as well. What starts as a very awkward and quiet relationship between Luke and Erica quickly turns into an unexpected friendship. Once we discover more about Luke’s past and where his troubles stem from, the film unravels a complicated blackmailing opportunity for Erica and her friends to take down Luke’s old teacher (Adam Scott) who also happens to be a local at their bowling alley. I’ll avoid getting into the specifics of this side of the plot since a lot of my enjoyment came from the unexpected turns the film took, but everything with Adam Scott’s character will either make or break this film for some people. The film travels to some uneasy places and cranks out some dark comedy in return. However, I think if you stick with Flower throughout its most uncomfortable elements and more dramatic moments, you will be rewarded with an extremely original and dark coming-of-age film that pays off exceptionally well when it comes to examining its characters and all of their complexities. Perhaps what makes Flower work as well as it does is Zoey Deutch’s charismatic and completely commanding performance that drives this entire film from start to finish. This isn’t to say that the supporting cast here is turning in weak performances, but everything surrounding Erica is reactionary to her or just simply caused by her. 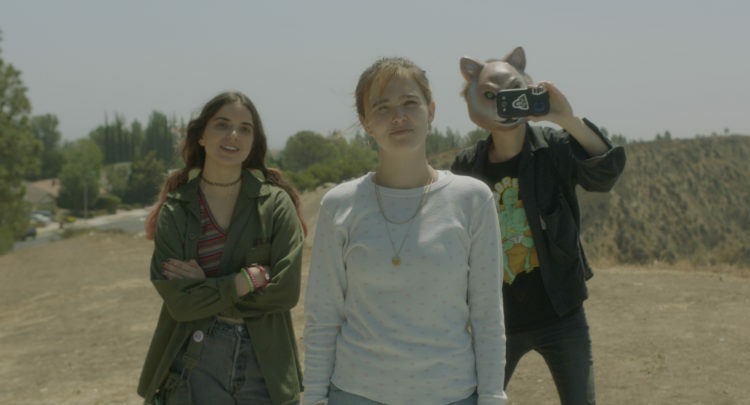 Erica is an already well-written and fully realized character, but Zoey Deutch’s performance only adds more intricacies and quirks to make her unique. The best moments of the film are simply the bonding moments between Erica and Luke, where Joey Morgan really gets to exhibit an excellently subdued performance as Luke and an even better chemistry with Deutch. Director Max Winkler takes the time to really develop the two characters and let their flaws play off of each other in a way that feels natural to the story. My only big issue with Flower is that it does have a little bit of trouble when it comes to wrapping things up in a way that doesn’t negate the rapid pace of the rest of the film. This is undeniably a flaw to the pace of the films otherwise tight 90-minutes, but it’s a flaw that I can look past because of how much Max Winkler commits to taking you on a journey with these characters that have a clear beginning, middle and end to their stories. Full of great performances from its cast, colourful and vibrant imagery, a killer soundtrack, and just being so wholesomely original and unpredictable from start to finish – Flower won’t necessarily be for everyone who decides to watch it, but those who love it will love it deeply. 4/5.